Growing up in the Catalan wine heartland of Alt Penedès, it’s amazing to find out that brothers Toni and Miquel Coca i Fitó don’t have a family history of making wine. This amazement is due to Miquel successfully exporting a great swath of Catalan wine producers and Toni being a superstar consulting enolog for over a dozen wineries in Catalonia. But Coca i Fitó is their personal baby where they’re given free rein to make, design, and sell the wines exactly as they want and do so quite successfully. Coca i Fitó is a creation that reflects the huge breadth of work that both Toni and Miquel have been part of around the region. Their base are the wines made in the village of El Masroig under DO Montsant. But, they also have the “Tocat” wines which they make in partnership with Roig Parals under DO Empordà. 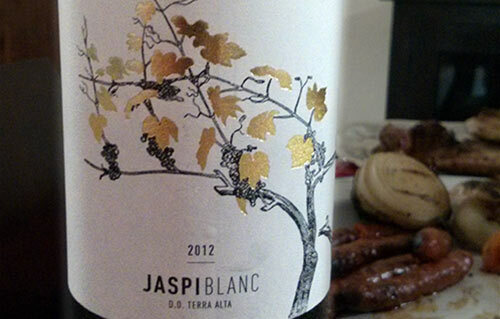 Then of course we come to the one wine they make in DO Terra Alta in the far south of Catalonia which is their Jaspi Blanc. It’s a wonderful example of everything that’s right about the beefiness of White Grenache when blended with the fruitiness of Macabeu. Mineral notes in the nose with lime peel and grapefruit. It’s smooth and fresh on the palate with a nice expressive acidity that lingers on the finish. These guys are my neighbors in El Masroig. I’ve tasted through most of their wines and they are all excellent!